"Aquatica Plus UK ships Green House Lot of 2pcs 10W RGB 12V Aircraft Aluminum IP68 Underwater Waterproof LED Light for Aquarium Fountain Swimming Pool Landscape Fountain Pond Outdoor from Amazon.co.uk. Amazon.co.uk has fast shipping in the UK and often free shipping on pond and aquarium supplies. Add to your basket now while supplies last to avoid delays." Attention: This light is with 25cm cord. No power cord or transformer included. 1. 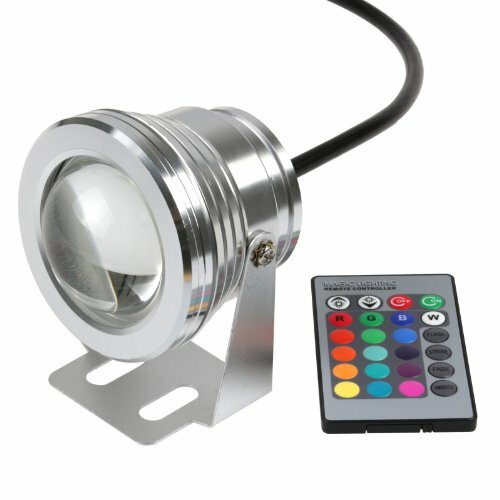 High power led underwater light is the perfect solution for decorative illumination water landscapes and illumination. 2. With an IP68 waterproof grade, it is perfect for Swimming pool, ponds, fountain, aquariums, recreational facilities, decoration underwater, park lake, water stage and other outdoor place for atmosphere decoration. All of our items come with 3-Month warranty guarantee, and have been completed aging test. (shipping cost should be for buyer's account during warranty period) .Our products are also tested for quality assurance purposes (CE,UL Listed, RoHS).